If you’re one of the millions affected by hurricanes this year, you’re going to want to know how to clean after a flood. When I first wrote this article, Harvey and Irma had just wreaked havoc along the Eastern seaboard of the United States. Since then, hurricanes have battered the same places. My area has seen its share of flooding, too. 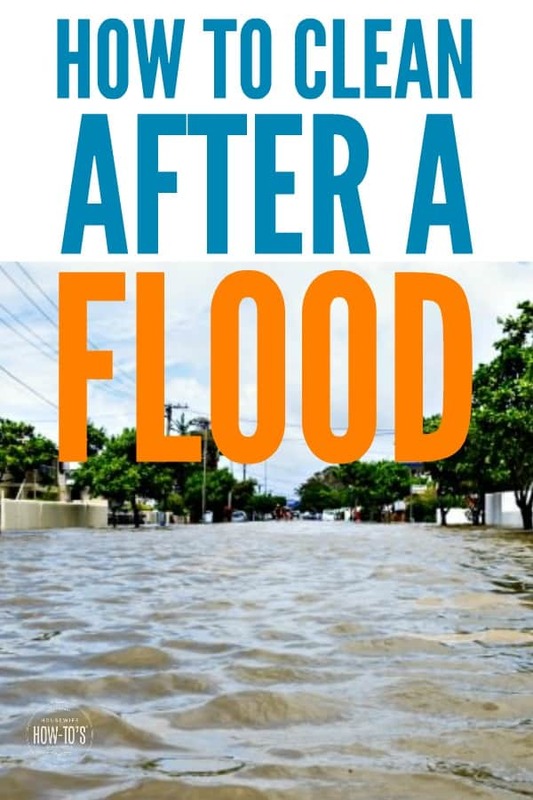 If you’ve been affected by these devastating events, I hope this guide offers some help as you face the enormous task of rebuilding your lives and your communities. There is more to cleaning after a flood than just letting things dry in the sun. Your health, your belongings, and the safety of your home’s structure depend on knowing how to clean after a flood the right way. A flood’s danger doesn’t go away just because the waters have receded. Do not return to your home until local authorities have given the all-clear. That signal confirms that utility services have eliminated the risk of electrical shocks to those wading through the remaining water and shut off natural gas to prevent explosions. Until then, remain in the location to which you’ve evacuated. Once the “all clear” has been issued, expect progress toward your home to be slow. You’ll be one of hundreds, if not thousands, of others seeking to get home. Pay attention to detour signs since road conditions may have changed — some may be gone entirely, others still underwater or massively damaged. Those signs are for your continued safety. Some areas forbid re-entry to flooded homes until a licensed inspector has verified that they are safe. If you aren’t sure whether your area requires such inspections, ask your insurance agent or local police. Not following this requirement may affect your insurance claim. If you evacuated or sought shelter out of the area, be sure to stock up on supplies before your return. Stores in your neighborhood may not even be open, or their goods may be damaged by flooding, too. Bring food for your family that you can eat without cooking, bottled water, toiletries (including toilet paper), and cleaning supplies. You should also stop at an ATM and refill your car’s tank. Before you enter your home, walk around and take lots of photos of the exterior damage. If there is standing water around your foundation, do not go in! Water pressure against your foundation poses a continued threat to your safety. If there is no standing water, look for loose power lines and smell the air for the rotten egg odor of leaking gas. If you find either, leave immediately and call the local utilities to shut off service. Otherwise, locate the outside shut-off valves yourself and turn these things off. While inspecting the outside of your home, take photos of the foundation, walls, windows, and roof. Document any fallen trees or damaged outbuildings with pictures. Also get photos of driveways or sidewalks that have heaved out of place. Your insurance agent will help you contact inspectors, contractors, and other service persons to repair your home. Your mortgage lender is also a useful resource. Both have an interest in helping you protect your home from further damage. Contact them. Keep a record of the dates and times of your conversation, along with any deadlines they give you for filing claims. 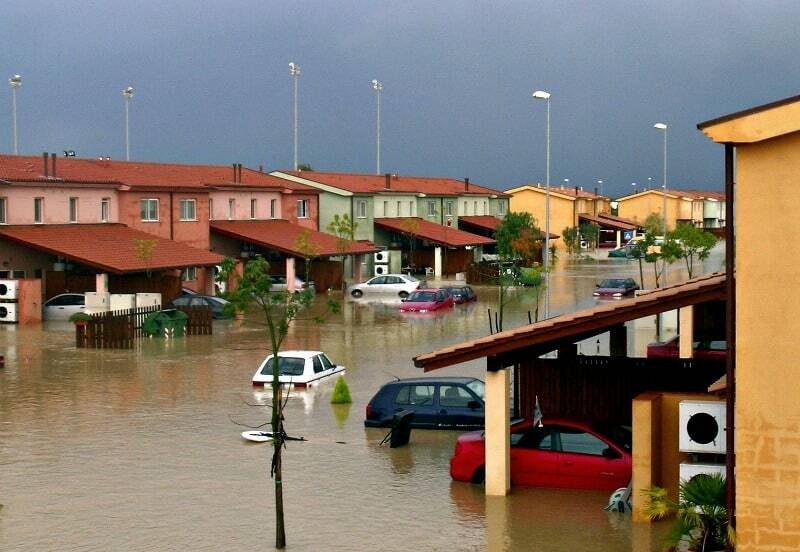 Protect yourself from contaminants in flood waters. The waters and residue they leave behind are full of substances which can cause disease and infection. Wear rubber-soled, closed-toe shoes (not flip flops! ), long-sleeves, and full-length jeans while cleaning your home after a flood. Use rubber or latex gloves to protect your hands. If you see mold already growing, wear a HEPA-rated mask that covers your mouth and nose. Inspect each room upon entry for signs of wildlife. In many cases, you can encourage animal intruders to leave your home by opening a window or door. Call animal control to deal with animals or snakes that don’t quickly flee. Mosquito-borne illnesses are common following a flood and can be very dangerous. Be sure to wear protective clothing plus use and frequently reapply effective repellents containing DEET (up to 20%). Essential oil blends will not protect you adequately! 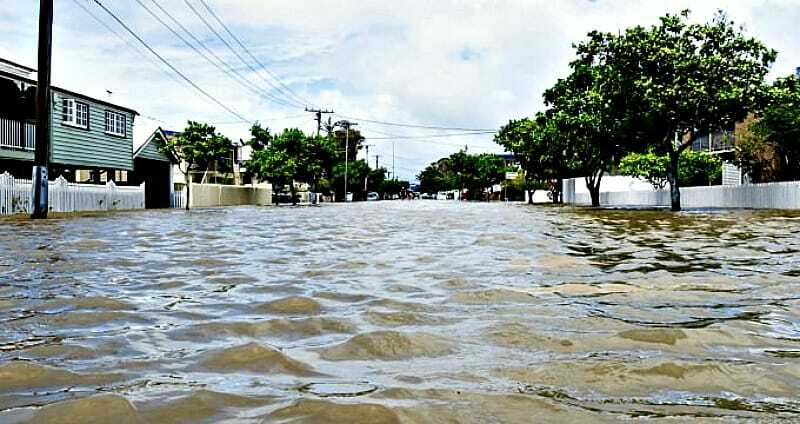 Flood waters often contain raw sewage in addition to pesticides, fuel, and other harmful substances. Treat all cuts and abrasions immediately to prevent infection. Wash your hands frequently, and shower with antibacterial soap at the end of each cleaning session. Launder all clothing you’ve worn at the end of each day rather than wearing it again for the next cleaning session. * Although paper towel use can be expensive and seems wasteful, the potential for contamination after a flood is too high to risk using cloth rags or towels. You need to dispose of the things you use to clean, rather than cross-contaminating surfaces. Make a disinfecting solution by combining 1/2 cup bleach and 1 gallon of clean water in a bucket. Given the enormous amount of harmful pathogens that exist in flood waters, do not substitute this with vinegar, baking soda, or essential oils. Your priority is getting things truly disinfected. Your insurance company may require inspection by a licensed electrician before using appliances after a flood. Check with them. Use disinfecting cleaner: To disinfect appliances, combine 1/2 cup bleach and 1 gallon of clean water in a bucket. Given the enormous amount of harmful pathogens that exist in flood waters, do not substitute this with vinegar, baking soda, or essential oils. Your priority is getting things truly disinfected. Refrigerators and freezers: Unplug the units then empty and discard the contents. Make a list of discarded items for your insurance claim. Use paper towels to dry them inside and out, then clean them with disinfectant. Do not rinse. Prop open the doors and allow them to air dry. Washing machine and dryer: Ensure the drain and vents are open then dry the units inside and out with paper towels and discard those. Clean them inside and out with disinfectant. Do not rinse. Run the washing machine on the hottest, highest setting adding only 1 cup of bleach and 1/2 cup of powdered laundry detergent to clean the inside of the hoses. Let both machines air dry, propping open the doors if needed, before use. Dishwashers: Remove and hand-wash all dishes left in the machine during the flood. After washing with liquid dish soap, rinse everything in a sink of hot, clean water to which you’ve added one tablespoon of bleach. Allow these dishes to air dry. Meanwhile, clean the inside of the dishwasher, including the racks and filters, using disinfectant. Run a cycle with two tablespoons bleach and your usual amount of dish detergent to ensure the disinfectant has a chance to clean the hoses, too. Once your appliances are in working order, clean your furniture. If you have not done so already, open all windows in your home to allow air to circulate and help your belongings begin to dry. Mattresses: Mattresses can’t dry out quickly enough after flooding to prevent the growth of mold, and there’s no way to kill harmful pathogens soaked into them by flood waters. Haul all mattresses to the curb for pickup and to get them out of the way of your other cleaning. Add them to your insurance claim, noting size, manufacturer, and model. Take photos to document it. Sofas, recliners, other upholstered furniture: As with mattresses, these items are usually unsalvageable after a flood and unsafe to keep in your home. Haul them to the curb, taking photos of each piece for your insurance claim. Take photos and video footage before cleaning. Ceilings and walls: Use damp paper towels to wipe away mud and other grime. Clean each room’s ceiling and walls using a mop and disinfecting cleaner. Change the bucket of disinfecting solution as soon as it begins to look muddy. Allow the disinfecting cleaner to remain in contact with surfaces for at least 5 minutes then dry with paper towels. Leave windows open and, if possible, run a fan to circulate air and speed drying. Carpeting: Wall-to-wall carpeting is generally considered unsalvageable after a flood, but check with your insurance company before pulling yours up! Take area rugs outside then hose them down with clean water on both sides. Hang them over a line or railing to dry. Your insurance agent may know of companies that specialize in cleaning flood-damaged area rugs. Launder smaller mats and throw rugs in your washing machine. Linoleum and tile: Unbroken linoleum and tile floors may be salvageable. Use paper towels to wipe away grime or mud. Mop the floor with the disinfecting cleaner, wait 5 minutes, then dry with clean paper towels. Remember, if the linoleum is torn or the tiles are cracked then the subfloor is likely damaged as well. Discuss this with your insurance agent as part of your claim. Vinyl plank and laminate floors: These surfaces are not waterproof and will most likely need replacement. You should still clean them for now using the disinfectant cleaner. Discuss with your insurance agent whether to add them to your claim. Wood floors: True hardwood floors may survive a flood if adequately treated, something best left to professionals. For now, remove grime with damp paper towels and mop them using the disinfectant cleaner. Wait 5 minutes after cleaning then dry the floors with paper towels to prevent further warping. If you can, run a fan in each room to help circulate air. Discard all food and toiletries that aren’t in airtight containers. Clean everything, including food containers, with the disinfectant cleaner. Allow these items to air dry. Clean all other surfaces, including windows, by first wiping away grime with damp paper towels. Be sure to look for places where dirt can hide: beneath bath mats, under counter edges, in floor vents. Repeat cleaning using the disinfecting cleaner, allowing hard surfaces to air dry but using clean paper towels to dry porous surfaces. Clothing: Use a hose to get rid of as much mud as possible then launder in the hottest setting the care label allows. Use bleach on towels, sheets, and white clothing. Run ALL items through the dryer or hang them in the sunshine to dry thoroughly — both methods will kill mold spores and most other pathogens. Put “dry clean only” items in a large garbage bag to take to the dry cleaners. Keep a list and take photos of anything unwashable to support your insurance claim. Shoes: If they can be washed, run them through the machine using a warm cycle and laundry detergent then allow them to dry in the sun. Leather shoes should be photographed and added to your insurance claim. Photographs: Place pictures in the freezer overnight, so they’re easier to separate without damage. Lay damp photos, images up, on a kitchen towel to dry. Once dry, give them a quick wipe on both sides with a disinfecting cloth and lay them flat to dry again. Books: Place them flat in a freezer. If you need to stack books, slip a sheet of aluminum paper between them. After several days, remove the books and air-dry them with the pages fanned. Add a double-thickness between the front and back covers and their neighboring pages. If the books are mass-market and easily replaced, add them to your insurance claim and move on to salvaging other items. Documents: Place them in the freezer to dry. Once frozen, gently pry sheets apart with your fingers. Do not force them. Lay separated papers on a clean towel to air dry and return stuck documents to the freezer. Repeat this process as needed. Electronics: These are probably unsalvageable. Take photos and write down details for your insurance claim. For computers, even if you add them to your insurance claim, take them to a local computer repair store to see if they can recover data from the hard drive. Fully open your windows once the weather is dry. Run fans in each room 24/7 to improve air circulation. If you discover mold or mildew after your initial cleaning efforts, you can try to treat mold on walls yourself. If these DIY remedies do not work, contact your insurance agent immediately to amend your claim and obtain professional mold-removal assistance. Recovering from a flood is no small task, nor is it an emotionally easy one. Be quick about contacting your insurance agent and securing your home against further harm, but take your time about cleaning. A slow and thorough cleaning after a flood will protect your health as well as your belongings. Thank you for sharing these important tips at #merrymonday We hope you will link up with us again!